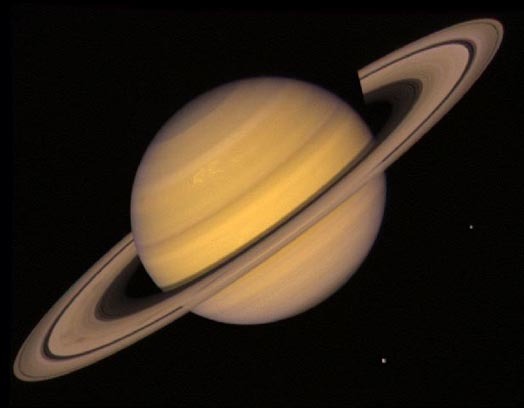 Explanation: NASA's robot spacecraft Voyager 2 made this image of Saturn as it began to explore the Saturn system in 1981. Saturn's famous rings are visible along with two of its moons, Rhea and Dione which appear as faint dots on the right and lower right part of the picture. Astronomers believe that Saturn's moons play a fundamental role in sculpting its elaborate ring system. A robot spacecraft named Cassini was launched last October and is expected to rendezvous with the giant gas planet in 2004.